Available in 10 and 12ft. sizes, these are giants! Click Link Below for the 12' Fun Station Water Trampoline!! 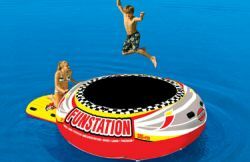 Inflation is easy with its single chamber design, and the attachable boarding platform makes it a cinch to climb on board the Sportsstuff 10' Fun Station Water Trampoline from the water! The included sea-anchor system keeps the Sportsstuff 10' Fun Station Water Trampoline stable as you bounce and lounge on this larger than life inflatable. Big time fun is yours with the Sportsstuff 10' Fun Station Water Trampoline! Have a great day on the water with the SportsStuff Funstation water trampoline!! The Sportsstuff 10' Fun Station Water Trampoline is brand new in the box with a full manufacturer warranty. Have a awesome summer with you 10' funstation water trampoline.